You left out Supernatural. Are people sleeping on that show now because of all these Super Heroespecially? And I still probadly won’t See Supergirl. Never seen it. Or the crossover. Wow. I feel Days of Future Past’ed all over again. Don’t feel good about that. First a version of him died, sacrificed himself, then he basically went to the pastonishing, re-wrote evrrytHonget and killed all the versions of the characters we knew up until now. I predict next season is gonna be about Barry running from those Deathly Hallow Dementor looking things for what he did. Apparently, the ending is setting up the Flashpoint storyline, which I have never read. My question is, since when can Barry suddenly, perfectly, control time travel? Also, assuming that the continuity overwrites itself next season, who is to say that Arrow doesn’t end this season with everyone getting nuked after all? There was one more episode of Flash? Season 1 only had 23 episodes. Wtf. Both seasons of The Flash had 23 episodes, just as all seasons of Arrow have had 23 episodes. Although, to it’s credit, Arrow did have a bonus recap special to kick off season 2. That being said… season 2 was a big letdown for me compared to season 1. The first season started off decent enough, barring the “let’s spend a bunch of episodes bringing in new characters to set up ‘Legends of Tomorrow’” and the “Ms. West is dying” subplot… but once they got to Earth 2, everything started to unravel. It’s almost like they had no idea where they were heading when the first half of the season began, compared to where they ended up in the second half. Didn’t feel the Flash finale at all we are basically starting over from season 1 finale just seems like a waste of 23 episodes. All the characters development is gone. It better be worth it next season, this even has undone all the feelings I had from Barry and his Speed Force Mom having that touching moment. Barry fucked up the timeline where the hell is Rip Hunter? Then the way Wally was like you know what, Eff that other one, glad you’re here though, high five. It was like at first they were giving respect to the situation and the other one then Wally was like who gives a fuq. I don’t even know what that picture is from. Whatever it IS from, though, it is wrong. Didn’t feel the Flash finale at all we are basically starting over from season 1 finale just seems like a waste of 23 episodes. All the characters development is gone. Actually, it’s starting over from season 1 EPISODE 1… literally, the opening scene of the first episode. Everything beyond that has been changed now. Ben Sokolowski left after episode 4. Grainne Godfree left after episode 5. Gabrielle Stanton left after episode 6. Andrew Kreisberg stopped writing after episode 9. Brooke Eikmeier stopped writing after episode 6. Right around episode 10 or so, suddenly, you have an influx of brand new writers coming in. Oddly enough, Legends of Tomorrow, which was mostly ranging between “ehh…” to “meh” for it’s first 13 episodes, actually ended on a high note with the final 3 episodes being the best the season had to offer. Complete polar opposite. One started great and ended up being not good at all and the other started being not great and ended pretty well. That’s the part where Barry enters Cerebro, gets Xavier to locate all the writers that left the show and then asks if he can replace Quicksilver since he’ll never get to play The Flash in any movie ever. 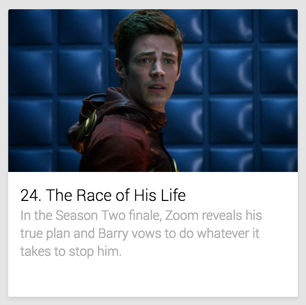 That’s a photo from where the group tosses Barry into the pipeline to stop him from racing Zoom. He’s looking at the group in this photo when he is told they all wanted to put him in there. What I mean is, I don’t know where the picture itself came from. Not what the picture is of. Whoever put “24” on that is wrong, so I don’t know what website Andrex got that from. BTW… if all my “friends” locked me up for wanting to get revenge on the person that killed my parents, I might not care about going back in time and wiping them out of existence either. Looks like it counted Legends of Yesterday from Arrow as episode 9. Nice. Got a free episode from a show I wouldn’t otherwise watch. Sweet Evil Jesus. I don’t know how you even come back from something like that. Legends of Tomorrow ends up getting a fitting finale episode and both The Flash and Arrow run their own series into the ground at the end. Color me impressed! Odd that they chose to end the episode as if they weren’t coming back next year and it was wrapping up a series finale. The one thing that might have made the episode better… was if they killed off Felicity and Ollie made off with Laurel. But that will never happen. And it looks like most everyone got the hell outta Dodge. Remember all those 15434 nuclear missiles that launched? Uh… exactly where did they all go? And the irony about that if they wasted all that time during the GOOD half of The Flash’s season setting up Hawk Girl and later Hawk Man, only for him to be out of the picture for 10 episodes on LoT and then having both characters completely exit the team. IGN gave the Arrow finale a 3.8. And, you know, I don’t have much else to say about that. The Flash got an 8.3… but I’m thinking that may have been backwards. That cliffhanger was kinda whack but it depends on where they go with it. I like it better than the s1 cliffhanger which just sorta ended that season on a fart. s2 was less consistent than s1 but it had some higher highs. Zoom owning Barry was brutal and one of my favorite comic fights ever, in TV or movies. When Zoom first appeared in the fall, that was good. Everything after that got worse and worse. And since when was Jay Garrick/Hunter Zolomon a scientist or an engineer? How exactly does he build a device that can shatter all reality, and do it with no one noticing? It’s almost as goofy as building a secret underground city, well, under a city… that I should mention was rocked by an earthquake 2 years prior. These shows must be trying to outdo the MCU in their nonsensical cartoony madness. So apparently I’m the weird one for preferring the Flash finale. LoT was just a big mass of safe boring beat the bad guy. The Flash finale may be worse, but it is much much more interesting. It may just be me, but they seem to be hinting at a Flashpoint season premier, and what a convenient time it would be to combine a few universes into one. And it definitely isn’t just me seeing Zoom become Black Flash. I wonder what they’ll do when they run out of speedster villains.